I have ordered a Dell XPS 15 9550 notebook some weeks back, together with it I have also purchased a TB15 dock to plug my Ethernet cable, external screen, mouse and keyboard. For some reason although Dell sold me and charged for the dock and was supposed to ship it together with my notebook, the Dock was never shipped. 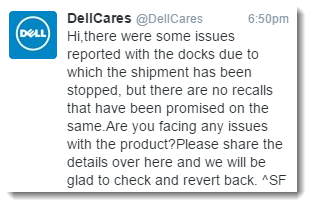 When I contacted my sales contact in Germany she told me I will get a refund because the dock has been recalled. I have also pinged @DellCares over twitter and they have confirmed the same. The Dell TB15 is a USB Type-C connector Thunderbolt Dock which apparently has been having several issues according to this Reddit. It is not completely clear at this stage if the recall is related only to the “unsold” items in stock or also to the ones the customers already purchased. The recall page at Dell doesn’t mention the TB15 recall, but also seems to have been updated in 2006 the last time :(. Know anything else about this topic? Please comment below. I’ve talked to four reps and supervisors at Dell, and they all have told me the TB15 is no longer for sale. Their engineering team has discovered a problem with the hardware that can not be fixed with any sort of software update. The only option they have for me at the moment is to be shipped a replacement, and still defective, TB15. This seems like a very unfair and deceptive business practice. Got a phone call with Dell Germany today where they confirmed the stop of sale of the TB15. I was given the option of redeeming my money or enlist for a replacement as soon as they come up with a fix.